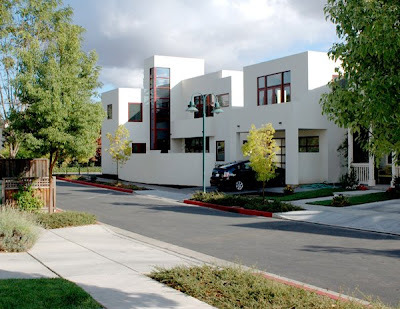 Do yourself a favor and contact Marcus & Willers Architects; the best architects in Northern California for Modern and Contemporary Architecture. We love this team! When architects Carol Marcus and Bill Willers set the design goals for their new home they wanted a home that demonstrated green building methods and would be a more healthful, resource and energy efficient way of life for their family. Marcus and Willers wanted their Sonoma home to be a modern expression in direct response the site conditions of their particular property while incorporating time tested solutions to living in this reqion and climate. The home is built on an infill site at a site density of 11 units per acre and is within walking distance of the Sonoma Plaza. Their 2,200 square foot house has four bedrooms, three bathrooms, and a detached garage with an independent 550 square foot second unit above it. That space is used as their office which enables them to walk to work. All of this on a 4,050 square foot infill lot that is located within a ¼ mile of all major services and within 300 feet of public transportation. The landscaping will be low water use and low maintenance. The structural, insulation and finish systems were selected for their durability, mold resistance, indoor air quality performance and resource efficiency. All concrete contains 25% flyash. Wall framing is made from light gauge steel. Exterior and Interior walls were framed into panels at a factory and then sent to the site to erected. Light gauge steel framing contains a minimum of 25% recycled steel and is 100% recyclable. All framing waste for this project was recycled. Steel framing will not rot, split, warp or support mold growth and will not become food for termites. The insulation used is a non-toxic, voc and formaldehyde free spray-on expanding foam insulation. The insulation when sprayed in place expands to fill all voids in between framing members. This produces a near air-tight wall construction that is superior in energy performance to standard stud and infill insulation systems. The insulation does not support the growth of mold and is not a food source for insects or animals. The roofing system is a Class A rated; non-toxic, water based and UV stable spray-on neoprene rubber membrane that contains no VOC's. To complete the system it is coated with a cool roof coating to reflect heat away from the roof surface. Exterior wall sheathing is an exterior grade gypsum board that will not rot; is mold resistant and is also not a food source for pests. Exterior wall covering is integral colored cement plaster. No painting is required with this finished durable surface. Designed to incorporate passive heating and cooling and to take advantage of Sonoma's unique climate this building has a thin cross section which provides ample cross ventilation, maximizes southern solar access and northern daylighting while minimizing solar gain from the east and west. To enhance natural ventilation the houses stair tower is used as a ventilation chimney to passively cool the buildings thermal mass overnight during the summer. Energy efficient systems include a hydronic in-floor radiant heating system, high performance insulation, 100% exposed flyash content concrete thermal mass flooring, and high performance windows and doors. The modeled energy performance of the building was 33% better than the strict California Title-24 State standards. This home demonstrates a comprehensive approach to green and healthful building design. The house was carefully planned to occupy an infill parcel while paying attention to solar orientation, access to prevailing breezes and views that enhance an overall passive heating, cooling and daylighting strategy. Construction materials were selected for their resource efficiency, durabilty and overall contribution to creating a healthful and energy efficient living environment.